What destinations can we choose from during our sailing class? ASA101 (Two day class): We work on basic sailing skills in ASA101 until students have learned to sail well enough to sail to other destinations. We travel to other destinations in ASA103, ASA104, ASA106, and ASA108 sailing classes. Our ASA101 class typically includes sailing in the water between the Annapolis Bay Bridge and Rock Hall. We return to our slip in Rock Hall both days where students can enjoy dinning in Rock Hall and visit the pool at the Haven Harbor South or use the BBQ grill. ASA101/103 (4 Day class): The first two days of a ASA101/103 class are spent sailing in the water between Rock Hall and the Annapolis Bay Bridge. We work on sailing skills until students have gained enough experience to sail to other destinations. On day three we typically sail either to Annapolis or Galesville, MD and return back to Rock Hall on day four. ASA103 (Two day class): A typical ASA103 class will sail from Rock Hall to Annapolis or Galesville, MD and return. ASA103/104 (Five Day Class): Since combination ASA103/104 students have already learned the basics in a previous ASA101 class, and since we have more days on the water we can venture further in a combination ASA103/104 class. A typical itinerary would be sailing to Annapolis on day one, Saint Michael's on Day two, Galesville, MD on day three, the Magothy River on Day four, and on day five returning to Rock Hall. Occasionally with excellent wind ASA103/104 classes have gone to Soloman's Island as an alternative to Saint Michael's. ASA104 (Three day class): Most ASA104 classes go to both Annapolis, Galesville, Bodkin Creek, Worton Creek, or St. Michael's. ASA106 (Seven Day): Our ASA106 classes on the Chesapeake Bay perform a circumnavigation of the entire Delmarva Peninsula. We typically take a clockwise approach. Once we depart Rock Hall we go north to the C & D Canal and spend the first night in Summit North, Marina, Bear, DE. Day two and three takes us through the remainder of the C & D Canal, down the Delaware River, through the Delaware Bay, and into the Atlantic Ocean. We then continue sailing through the night and do not stop until we reenter the Chesapeake Bay. Once we reenter the Chesapeake Bay we usually go to Cape Charles. We then use days 4-7 to sail back up the Chesapeake Bay to Rock Hall. Destinations depend on our location at sundown. Typical stopping points include Smith Point, Soloman's Island, Herrington Harbor, Tangier Island, Reedville, or other locations. How to get to Delmarva Sailing School and where can I stay? 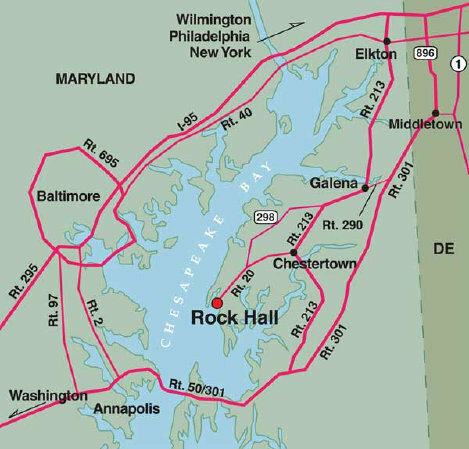 Students who are driving to Delmarva Sailing School in Rock Hall, MD can visit the Courses page and get maps and an address for GPS. Students who are traveling by air should fly to Baltimore Washington International Airport (BWI), and then get a limo via Ready to Roll, LLC 800-787-1609 or rent a car in order to drive the 35 miles to Rock Hall, MD. There is plenty of free parking at the Haven Harbor South marina where we are located. Students typically arrive the evening prior to their class, and spend the night on our training vessel Gallivant. Students then also spend all nights during their classes on board Gallivant. If you need a hotel please see below hotels in Rock Hall, MD and Chestertown, MD (12 miles away). Having the right things with you on a sailboat improves both your comfort and safety. We have created a list of things our students may want to consider bringing with them during their class. Please click here to get the list. To get list of what to bring. Where will I sleep on board? Gallivant has four sleeping areas. There are two private double berths with a door located fore and aft, and two settees in the salon area that both convert into single berths. You can see them on the "Our Teaching Vessel" page. Please scroll down to the botttom of the page to see the settees and berths. The captain typically sleeps in the port settee in the salon area so he can get up to check the boat at night without disturbing anyone. Students are assigned to the other three sleeping areas. Couples are given priority to berth assignments. If one student is a woman then she would typically be assigned a private berth. Since there are four places to sleep on board this means that three single students and a captain make up a full boat. Note also that if there are couples there could be more students since a couple can share a double berth and there is still room for two singles and a captain. If we have a full boat then one student has to sleep in the starboard settee. Note that there is a table dividing the port and starboard settees so it is not like doubling students into a berth. Please note that Delmarva Sailing School does not double single students into one double berth. Many other sailing schools double single students into a double berth and put up a lee cloths down the middle. Our policy of not doubling single students into a double berth is in line with our desire to keep the highest standards possible in our classes. We believe that our sailing classes should maximize sailing education and also be fun. Also please note that any Practice Sailing Program (PSP) students who might be retaking the class for 50% of the normal price get lower priority in terms of where they sleep. The total on board is still the same however. PSP students are only allowed to participate in a class if the boat is not already full with first time students. What will be included in terms of meals and beverages on board? Sometimes the instructor will contact you prior to your class to discuss food preferences but in most cases, shortly after students arrive, students sit down with their instructor and decide what food and beverages should be purchased. Leaning what foods and beverages work out well on a boat is part of the class and an important part of learning to cruise. In most cases students eat all or nearly all breakfasts and lunches on board. Dinners are eaten off of the boat in local restaurants unless there is no restaurant available. In the event that a boat stays overnight at anchor or on a mooring ball where local shore-based dinner is unavailable, dinner will be planned, provisioned and provided by the school. Students are responsible for purchase of any meals in local restaurants. Lunches in many cases consist of sandwiches or wraps with lunchmeat, cheese, lettuce, tomatoes, etc. Breakfasts often consist of hot or cold cereal, juice, eggs, and coffee or tea. Most classes also want snacks like fruit, cookies, etc. and all of this is included. Beverages include bottled water, soft drinks, juice, etc. Per local laws, no alcohol will be purchased for students. Alcoholic beverages are allowed to be consumed on board when we are not underway at the captain's discretion, but purchase of alcoholic beverages is not included in the beverage allowance. Students who wish to drink alcoholic beverages should bring what they want to drink or plan to purchase it locally. No alcoholic beverages are allowed while we are underway. We feel that our budget for food and beverages is very generous and meets the needs of most students however if you have a special diet, or if you prefer extravagant foods which cost more, an additional charge for food and beverages may apply or you can bring your own food and beverages. Students are welcome to bring food and beverages with them if they wish but no reimbursement for food and beverages brought with students will be provided unless this is agreed upon in advance. Docking classes do not include any food or beverages. How much should I tip the instructor? Some students give more but a gratuity of 15-20% of course fees is typical. Cash is appreciated. Typically 2-4 students are in each class. We allow up to five as maximum. 2 students are required to go forward with a class. Do I get my money back if I have to cancel a class? Do students get their money back if the school has to cancel a class? What happens if there are problem on the boat that require repair and possibly lost time under sail? It is very unlikely that we would cancel a class but if we cancel a class then students can reschedule or receive a full refund minus the cost of the course materials. Full payment is due when students sign up for classes. Terms for ASA101, ASA103, ASA104, and ASA118: ff you cancel 30 days or more prior to the class start date, then we will refund 50% of your payment minus the cost of the course materials. No refund will be given if you cancel the class less than 30 days from your class start date. Terms for ASA106 and ASA108 classes: If you cancel an ASA106 or ASA108 class then we will refund half of your payment if you cancel 120 days or more prior to the class start date shown on our calendar. No refund will be given if a student cancels with less than 120 days’ notice. Terms for Home Studies: No refunds are given for ASA105 or 107 home studies. By making payment for classes you agree to accept our terms. Although we spend a large amount in preventive maintenance on our sailboat, sailboats are very complex systems and problems occur of one type or another can happen. Learning to deal with issues on the boat is normal and part of sailing. Our experience has been that so long as the class goes forward students welcome the challenges provided by problems on the boat. For example if the dinghy starts leaking, the captain and students may need to stop and fix it using the dinghy repair kit on board our vessel. The class would then continue on as normal after the repair is completed successfully. Other examples could be given but in general as long as the class goes forward and we have time to complete all the skills required in the ASA standard no refund would be given. Is it possible that I will have a different instructor than the one indicated when I signed up? Although most classes go forward with the instructor listed on the schedule page of our website we reserve the right to change the instructor at any time. This is necessary sometimes due to illness, death in the family, scheduling conflicts, etc. Is tobacco allowed on our sailboat? We do not permit smoking on our sailboat. We also do not allow chewing tobacco on our yacht. We realize that things happen such as trip cancellation, illness, death in the family, missing your flight, or other problems so we recommend students purchase travel insurance. If you choose to not purchase travel insurance, you are assuming any financial loss associated with your travel arrangements. In order to obtain travel insurance, contact your insurance agent or other insurer to ask about travel insurance plans. Please see below an insurer who offers travel insrance that can be customized for your needs. to get information about insurance.